You don’t need to have been to the Longhorn state of Texas to know that Texans like it big, they like it meaty and above all they like it spicy. I am of course talking about their food. Tex Mex is big business over here in chilly Blighty, starting off in the 70’s with the hugely popular chilli con carne and now taking over our ‘world food’ aisle in the supermarkets. 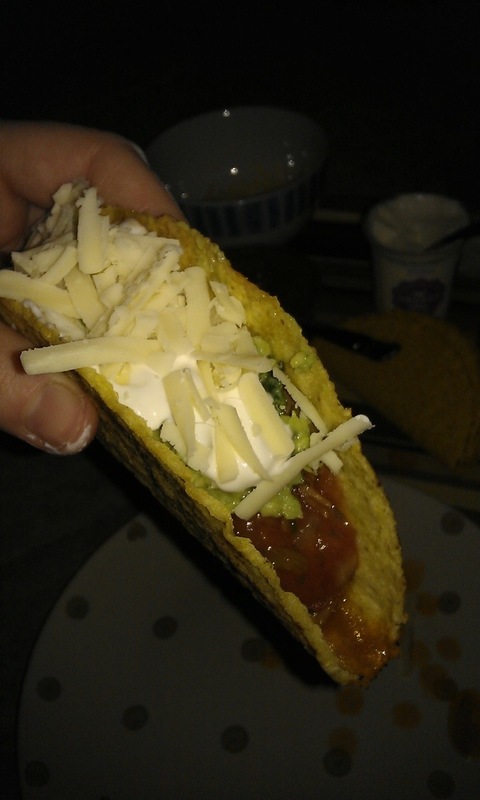 You can’t move in Tesco for people with a fajita kit, some guacamole or taco shells and most people I know now rely on fajitas for a speedy weeknight meal. We’ve taken it to our hearts, and who can blame us for wanting a bit of Texan warmth in our kitchens when the clouds are grey and the rain eternal. But with ease and familiarity comes boredom. Tex Mex will surely go the way of spaghetti bolognese, a tasty and satisfying dinner but nothing to get excited about and eaten with little fuss or fireworks. Something needed doing, and gosh darn it, I’ve done it, and got myself all excited over Tex Mex again. Having bought a book stuffed full of delicious looking Texan food and being unable to cook practically anything in it, I desperately turned to Google in the hope I would find something to sate my increasing appetite for authentic Tex Mex. What I found may well be the tastiest recipe on the Internet and easily the nicest recipe I’ve ever made using my slow cooker. Texan BBQ pulled pork. It’s unbelievably simple to make, all it requires of the cook is to chuck a few ingredients in the slow cooker and then leave all day so that the pork falls to pieces at the mere mention of a fork into the smoky BBQ sauce. It really is very good. The author of the recipe suggests stuffing the pulled pork into hamburger buns,which I’m sure is delicious but craving some Tex Mex I couldn’t think of a better way to show off the pork than with taco shells with all the trimmings. It’s a feast, for sure, but living alone for a few weeks doesn’t mean I have to resign myself to ready meals or jacket potatoes. My options are limited as it is with no oven, and the horrific stereotype of sad ‘Bridget Jones’ women eating their lonely ready meal for one really grinds my gears (as the Texans would say). Eating dinner alone needn’t be a dreaded event, and there are times when I really look forward to being alone at the end of a busy day or week and just taking time for myself to eat what I want and watch what I want on the telly. I don’t like being apart from The Boyfriend for so long and there have been some pretty tough times, but there have equally been plenty of amazing times with friends, family and just myself. Without the dark we can’t truly appreciate the light, and realising you can still have a happy, fulfilling time while missing someone like crazy is eye opening and makes you more independent and comfortable in your own company. In short, make the best of a tough situation and don’t neglect yourself. With the pulled pork and tacos I also had sour cream, cheddar, salsa and homemade guacamole, possibly the only recipe from my new cookbook that I could actually make in my kitchen. Again, it’s very easy and just involves mashing up an avocado with some of my favourite ever ingredients, lime juice, coriander, garlic and chilli. How can you go wrong with a dish when its got those babies in it? The Homesick Texan, by Lisa Fain is all about a Texan who moves to New York and struggles to find the authentic foods she grew up on and loved. To overcome this she took to perfecting the recipes herself and started a blog which was so successful that this book now graces my shelves. I find it hard to believe anyone would struggle finding Tex Mex in the most restaurant crazy city in the world, but what do I know, I’ve never lived there? I’m sure I don’t need to tell you how outstandingly good the pulled pork tacos were, the photo tells you everything you really need to know, but I’ll say it anyway: they were epic. 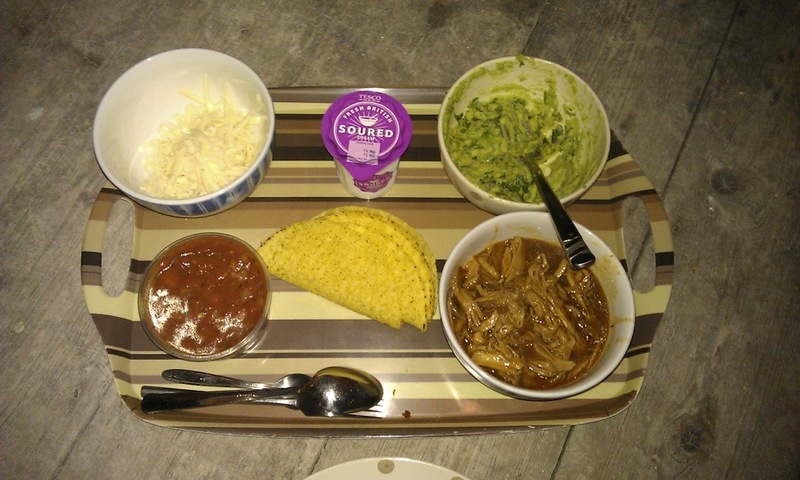 The strong BBQ flavour of the pork stands up really well to the salsa and guacamole, while the sour cream cools the mouth and prevents the BBQ from being sickly sweet. Add in the crunch from the tacos and you’ve got a perfect meal to end the weekend with. I highly recommend you make this. Be prepared though for messy fingers and cheeks covered in salsa and sauce, this ain’t first date food! I’m absolutely making this for The Boyfriend when he comes back, after nearly 10 years together we can handle seeing each others hands and face covered in food. If you make this meal and find you don’t like it, then I don’t think we could ever be friends. You can find the recipe here, http://allrecipes.com/recipe/slow-cooker-texas-pulled-pork/ and I urge you to try it to combat the familiarity of fajitas and nachos. Do it for the Tex Mex reputation!